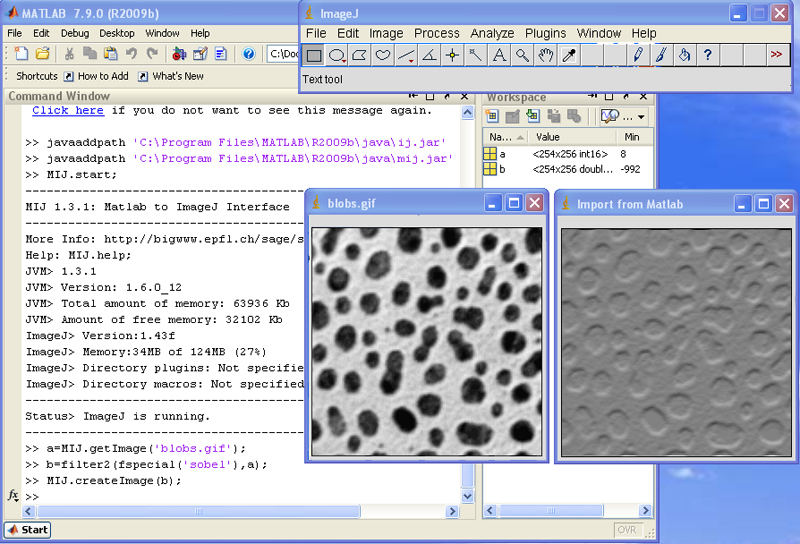 MIJ offers the missing link between two imaging software: ImageJ/Fiji and Matlab. The goal of the package mij.jar is to provide static methods to exchange images and volumes. 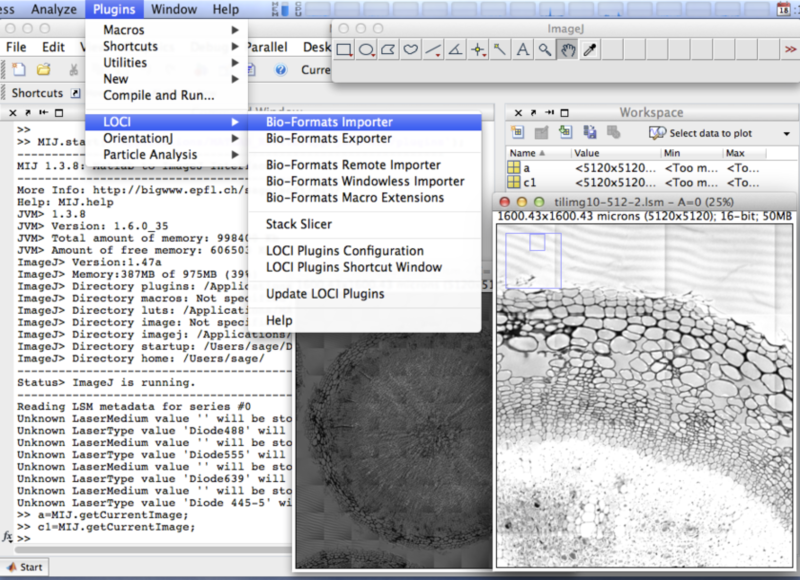 MIJ allows also to access to all built-in functions of ImageJ and to third-part plugins of ImageJ. MIJ is integrated in Fiji with a super-easy script to use it. Thanks to the Fiji team, MIJ is now super-easy to use using a Matlab script Miji.m which is integrated in Fiji. 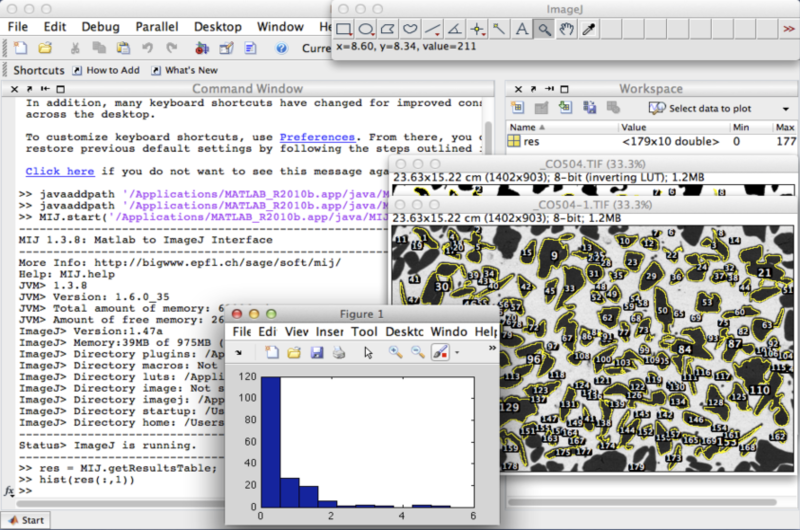 ImageJ/Fiji becomes a image-processing librairie of Matlab. The package requires a proper installation of ImageJ and Matlab. The package was tested since Matlab 7.9.0 (R2009b) on different plateforms a Windows XP, Mac OSX 10.6, and Linux Ubuntu. Download mij.jar and place it into the java directory of Matlab (e.g for Window Machine 'C:\Program Files\MATLAB\R2009b\java\'). Copy also the ij.jar of ImageJ in the java directory of Matlab. Extend the java classpath to mij.jar, e.g using the Matlab command: javaaddpath 'C:\Program Files\MATLAB\R2009b\java\mij.jar'. Extend the java classpath to ij.jar, e.g using the Matlab command: javaaddpath 'C:\Program Files\MATLAB\R2009b\java\ij.jar'. Edit the java.opts file to increase the JVM memory. Check the Matlab page. With the more recent versions of Matlab, you can increase the memory by using File > Preferences > General > Java Heap Memory.